Casa Central, the largest Hispanic social service in the Midwest, hosted a Business Networking Luncheon on Thursday, Aug. 17th. 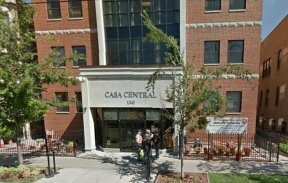 Casa Central founded in Chicago in 1954 and has since grown into the cornerstone for the Hispanic Community serving 20,000 people a year. It has delivered award winning programming transforming lives and strengthen the community. “We do everything from early childhood and head start education, all the way up to senior citizens wellness and home visits, we work with families that are homeless to get them back on their feet in terms of shelter, but also job training and whatever they need in terms of wrap around services to be able to go back into the world intact,” said Martin Castro, Interim President and CEO of Casa Central. 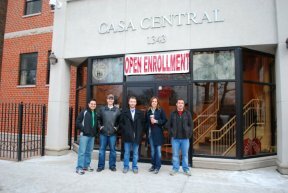 Casa Central has about 600 employees providing direct service from their wide range of network of programs for children, youth, individual families and seniors. “With this event, we want to expose more people to the work that Casa is doing on a daily basis, it’s amazing how many people pass buy us every day, they see the buildings but they don’t know what’s going on inside those buildings. We want people to stop, come on in, take a look, and learn more about our programs and see how we partner and collaborate with them.” said Castro. The event started with keynote speaker Jose Garcia, Vice President and Regional Sales Manager of Harris Bank giving a short presentation offering financial education seminars to eliminate financial barriers by providing tools and resources to nonprofit organizations like Casa Central. Casa Central showed a short video presentation based on Casa Central’s mission and the impact it has made on their participants. The event provided food and raffles while members whom have volunteered at Casa Central spoke of their gratifying experiences and support. The event ended giving tours to the guests around Casa Central’s buildings where they offer an array of services from school age programs and day care to children and youth. Transitional housing for families experiencing homelessness, violence prevention and intervention, and employment training for individuals and families. Moreover, Adult Wellness Center and Home Care Services for seniors. Guadalupe Martinez, one of the participants from the Home Care Services for seniors said, “We have activities, various games, all the staff is very efficient and the environment is where you can breathe fellowship. Is like saying you are going to school again, sympathize with your companions, create games, and especially all the support that the staff offers.” Martinez has been coming to the program for five days a week from 9am to 3pm for more than a year. “I will continue coming here for many years, there is a lot of people that have 20 years, 15 years, and 12 years that have benefited from this program. They come here with disabilities and come out with most of those disabilities resolved, not entirely but with major breakthrough. I recommend all the people that are currently in your home and feel there is nothing to do, to come here,” said Martinez.